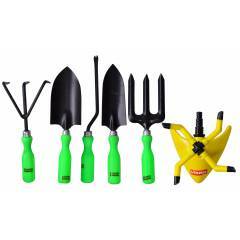 Kit includes 1 Trowel,1 Cultivator, 1 Transplanter , 1 Weedier, 1 fork and 1 Water Sprinkler 4-arm. Use Trowel to dig up the soil. Use Cultivator to scratch off dead leaves and other materials. Use Transplanter to move the soil from one spot to another or to transfer it to a special pot. Use Weedier to clean the area off small weeds and grassesUse the flat tines Fork to keep the soil aerated by digging and mixing it up from time to time and allowing the roots to spread out easily. Use Water Sprinkler to provide water to lawn and plants. This sprinkler can be attached to a hose pipe which in turn is connected to an outdoor water faucet. Visko 606 Garden Tool Kit with Water Sprinkler (Pack of 6) is a premium quality Gardening Tool Kits from Visko. Moglix is a well-known ecommerce platform for qualitative range of Gardening Tool Kits. All Visko 606 Garden Tool Kit with Water Sprinkler (Pack of 6) are manufactured by using quality assured material and advanced techniques, which make them up to the standard in this highly challenging field. The materials utilized to manufacture Visko 606 Garden Tool Kit with Water Sprinkler (Pack of 6), are sourced from the most reliable and official Gardening Tool Kits vendors, chosen after performing detailed market surveys. Thus, Visko products are widely acknowledged in the market for their high quality. We are dedicatedly involved in providing an excellent quality array of Visko Gardening Tool Kits.